I think, therefore I creatively paint! Yesterday, my wife and I were walking and she made a comment about wanting to learn how to paint using watercolors. She also said that she has never been able to create a painting that is “good.” She said she is not creative! I responded by saying that I thought creativity could be learned, and if one’s standards for painting were “lowered,” then anyone could create a good painting. I used examples of impressionism and cubism which, from my point of view, have standards that allow the result to not look like a photo of the model for the painting. Also, regarding one’s standards, I think the artist should set her/his own standards. This is especially true when the artist is creating for her/himself. I think creative people are not born creative. In other words, I don’t think the nature part of us dictates our creativity, but I do think the nurture part plays a role. Children, that are raised in an environment that stifles their creativity by forcing them to live up to unreasonable standards, will tend to think they aren’t able to create art. They will not attempt to create and will exemplify the old adage of, “use it or lose it.” They don’t use their creative thinking and therefore, lose it. 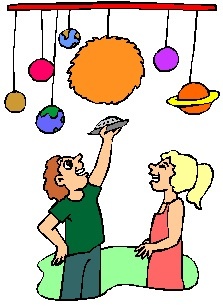 Here’s a creation representing our solar system! 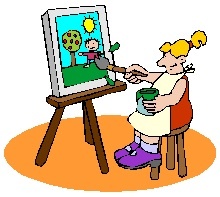 So, what should we do in order to become a painter, musician, sculptor, builder, writer, cook, dancer, etc….? Well, one thing we shouldn’t do is nothing. The best way to become more creative is to create. Generate lots of ideas and decide, using your own standards, which ones to keep. Break a routine and do something differently. Generally, creativity means change and doing something in a different way. So, what should we do if we want to paint a picture using watercolor? Get a brush, some watercolor and a surface to paint on and paint. Simple? Yes, if you can obtain the materials. How do you become more creative? Exercise your creative mind! This entry was posted on Thursday, November 19th, 2009 at 1:00 am and is filed under R2, Ron Rogers, Writing for learning. You can follow any responses to this entry through the RSS 2.0 feed. You can leave a response, or trackback from your own site. One Response to What Does It Take To Be A Creative Person? A very well written essay — -and I could not agree more. I am an artist, self taught, for the most part, and the elitist nutjobs who run the art world would just like it to be an exclusive club. They don’t hold a monoply on art, contrary to their opinion…art belongs to every one, and I really beileve that there is no greater gift a person could give themselves, than this: permission to be an artist.